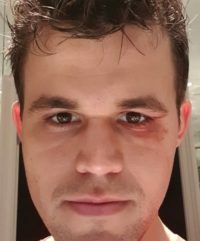 Magnus Carlsen was sporting a blackeye as he geared up for another round of competition at the World Chess Championships in London on Wednesday. He joked himself on social media that “the match is heating up,” while his doctor didn’t think his injury sustained on the players’ day off would cause any problems when more serious play resumed Wednesday afternoon. “There’s no concussion, as we had feared,” Dr Brede Kvisvik told Norwegian Broadcasting (NRK) Tuesday night, after Carlsen was injured while playing football earlier that day. He collided with another player and sustained a minor head injury, which also left him with a blackeye. Brede said Carlsen otherwise was fine, and the cut he also sustained “isn’t so big that we need to do anything with it.” No stitches were necessary and ice was applied to ward off swelling. “If he has any vision problems, then it can be difficult,” Brede added, but he claimed Carlsen’s brain was “functioning just as well” as always. The doctor thus didn’t think Carlsen would need to call in sick for the ninth game in a championship that remains even against challenger Fabiano Caruana. The two players have tied every single round they’ve played and currently stand at 4-4. “He (Carlsen) actually thought it was kind of funny that he got hit during football training,” Brede said. “It looked worse than it was,” with the doctor adding that Carlsen chose to keep playing football as a break from the chess board, and received his doctor’s permission.